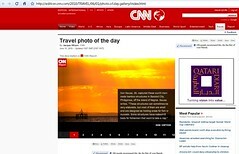 My photograph, "Sea House", was published on CNN Travel. The picture was taken on April 11, 2010 near Bacolod, Philippines and was awarded as "Travel Photo of the Day" by producers. My caption, "These structures can sometimes be very elaborate, but most of them are small and are designed as holding areas for fish or mussels. Some structures have makeshift beds for fishermen that want to take a nap." Access this link for details on the gear that was used and a full picture.